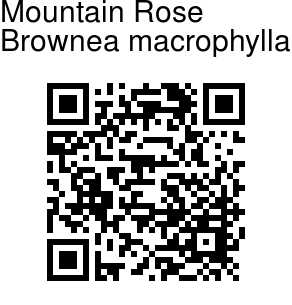 Mountain Rose is a tree which occurs in Colombia and Venezuela, though it is widely grown in other tropical regions worldwide. It grows into a nice medium size tree 20-25 ft (smaller in containers), with dense umbrella-like canopy, spreading 15-20 ft wide. Flowering occurs on 3-4th year from seed. 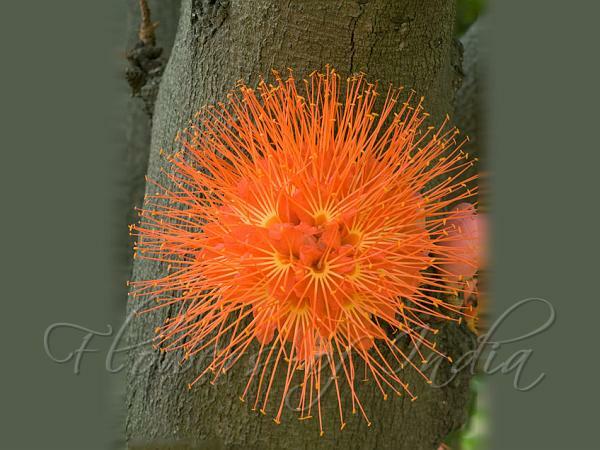 Flowers occur right on the trunk or on the base of branches in brilliant red clusters. Leaves are very long, even-pinnate, with pointed leaflets. Young leaflets are pale green to pinkish, almost white, sometimes with light variegation, and hangs down like a large handkerchief (like in all related species (browneas, amherstia, maniltoa, etc.). Photographed in Lalbagh Botanical Garden, Bangalore.